Jun Yang‘s lab focuses on the molecular mechanisms of hereditary retinal degenerative diseases, focusing specifically on the mechanisms of a set of inherited diseases in Usher Syndrome where people go blind and deaf due to defects in the cytoskeleton of photoreceptors in the eye and hair cells in the ear. She explores the cell biology of photoreceptors with mouse models of Usher Syndrome and a combination of approaches in molecular and cellular biology, biochemistry, electrophysiology, behavior and microscopy. Jun obtained her B.S. degree from the Biology Department at Nankai University in China and then worked in industry for 7 years. She then came to the United States and started her Ph.D. study at the University of Massachusetts, Amherst. She earned her Ph.D. degree in Dr. R. Thomas Zoeller‘s laboratory, where she studied gene expression changes in fetal alcohol syndrome. Jun did her post-doc in the Berman-Gund laboratory for the Study of Retinal Degenerations at Harvard Medical School under the supervision of Dr. Tiansen Li. 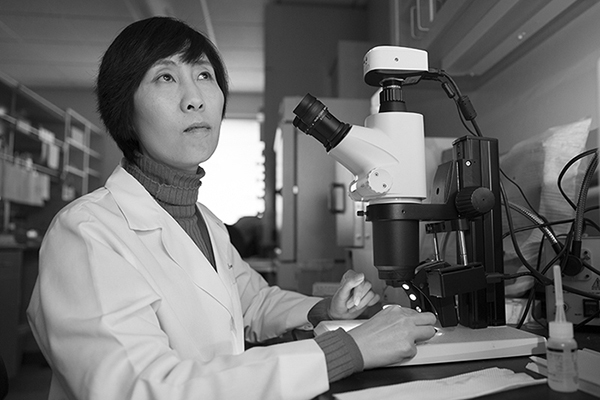 In 2008, Jun established her own laboratory as an assistant professor here at the John A Moran Eye Center, University of Utah. Image courtesy, Bryan William Jones.